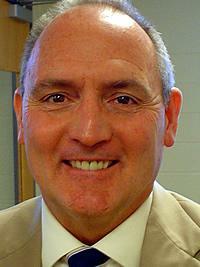 The Board of Education hired Dr. Phil Cagwin to be the interim Superintendent of the Monroe Local School District. Dr. Cagwin recently retired after spending the last ten years as Superintendent of Talawanda City Schools. He is contracted until the end of the 2012-2013 School Year. The city of Monroe had paid for the a School Resource Officer (SRO) until the city fell into fiscal emergency eight years ago. At that time, police Chief Greg Homer said he worked out an agreement where the school would pay for the SRO while at the high school. Because of the district’s recent financial woes, the SRO position was cut in January and the officer was out of the school by March. Tonight, Superintendent Cagwin (photo) will be addressing Monroe City Council regarding a School Resource Officer. Beagle: I understand you will be a visitor at the next Monroe Council meeting. According to the agenda you will be discussing the School Resource Officer position at the district. Cagwin: Yes I am on the agenda to talk about school resource officers. Obviously I have little experience at Monroe, so cannot speak directly to that. I will have Bob Millisor joining me. He has years of experience at Monroe, and has a good feel for how beneficial an SRO has been for Monroe over the past few years. Beagle: How important is the SRO for MLS? Cagwin: From my experience at Talawanda, I can say that an effective SRO program can be a great addition to the school district. Beagle: Will you be asking the city to shoulder some or all of the costs? Cagwin: I know that our school district is not in the position to fund an SRO at this time. I don’t know the financial situation of the City, but I hope they have the position already budgeted for, and can assign someone into the position for the remainder of this school year.